The list has been made for the week and we need to get-a-moving. 22 items on the list, why does that make me weary? At least it is shorter than last week, but the week is just begun and sometimes items get added as the week progresses. The good news is that as the project is accomplished we get to erase it from the dry erase board. Last year Missy bought it to try to organize our thoughts in one convenient location, the middle of the kitchen. 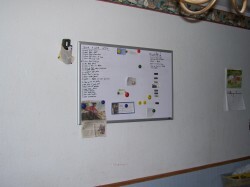 Everything that is happening with the garden is posted on that board, all the markets we go to, the contact phone numbers, business cards, newspaper articles done on our farm, and later the vegetable orders for each market. It has been a great help so that we don’t forget some important detail for that day or week. Today the list reads: MONDAY! Lay plastic 1 block, weed uncovered corn, clean up NW corn block, seed beets, mow lower 23 sections of lawn, Transplant 3 trays grapes. Of course that is just a basic list for the day, we will also be watering the greenhouse, cleaning up the kitchen and all the normal daily jobs. Some of the jobs for the week include: Plant Broccoli, cabbage, cauliflower, cover seeded melons, weed-eat upper patch, clean-up rest of garden, mow berry patch, plant basil and parsley, plant 80 rows of corn, plow rest of garden, get pump going, and more. Well the list was longer last week and we ‘almost’ got it all done. We will see if we can get it all done this week. Have a happy planting day! This entry was posted in Planning, Planting, Weblog.